The Areca Palm (Dypsis lutescens) is a wonderful choice of indoor palm tree to bring a touch of the tropics into your home. Growing in clusters of slender yet erect stalks, it has a feathery appearance to the leaves. Preferring warm and humid climates, this is a very popular houseplant that can provide you with many years of lovely greenery. It’s important to note that this plant is reasonably challenging to care for and doesn’t tolerate being neglected. It’s not the sort of houseplant that you can simply pot up, and forget. 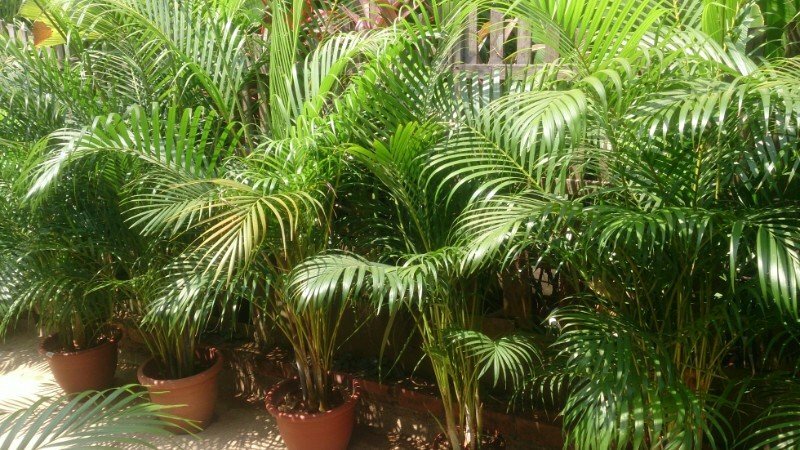 If you are looking for an easier to care for indoor palm, the Kentia Palm is a great option. I’ve a great Kentia Palm care guide here. Water Maintain moist soil. Water when top 1-2 inches of soil is dry. Light Bright, indirect light. North or east facing window. Humidity Average humidity of 40 -60% is perfect. Pests And Diseases Prone to spider mites and mealy bugs, but easily treated. Since full grown Areca Palms are quite expensive, most people buy them when they are small and use them as a tabletop plant. 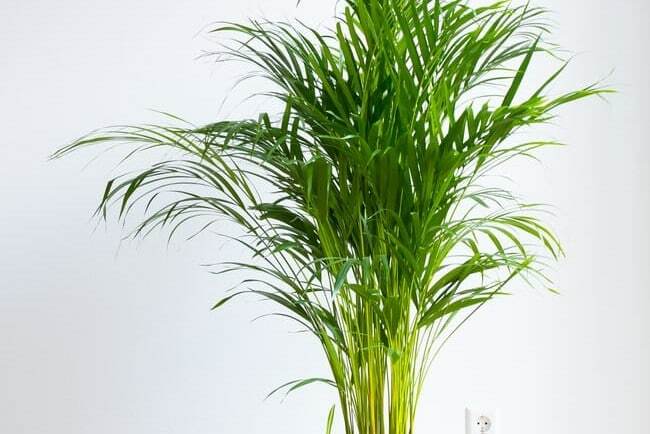 If you are looking to buy an Areca Palm that will be delivered to your door in great condition, Costa Farms are a fantastic supplier and sell nationally on Amazon. Areca Palms grow approximately six to ten inches annually until they reach their maturity at about six to twelve feet. They have a lifetime of approximately ten years providing they are well cared for. They do well with trimming should the fronds become too large and you can simply snip them back if they are becoming unruly or overly long. This won’t harm the plant in any way. With a smooth silver green trunk, the Areca Palm is topped by feathery fronds. These fronds grow in clusters or thick clumps. These clusters are approximately six to eight leaves, on long curving upward petioles. It gives them the appearance of butterfly’s. Leaves have approximately 90 to 110 leaflets that appear to be in the shape of a “V”. The more mature plants have many characteristics like a bamboo palm. There are many different names that the plant goes by including the butterfly plant, bamboo palm, golden cane, or simply palm. How Do You Water An Areca Palm? Areca Palms require just enough water to keep the soil moist, but not so much water that it’s drowning. This may take a bit of trial and error. You’ll want to check your plant daily to make sure that it’s not too dry. Strive for moist soil but not soggy and you’ll do well. During the cooler winter months you can allow the soil to dry out in between watering. Areca Palms do well in self watering pots, which will keep the soil lightly moist and reduces the need for you to monitor your Areca Palm as closely. I’ve found using self watering pots really helpful as my houseplant collection grows. I’ve written a guide to how self watering pots work, which you might find useful. If you want to find out which ones I’ve used and think are great, read more here. One of the most important factors in tending to your Areca Palm is to give it the proper amount of light. Areca Palms tend to do best with indirect sunlight that comes through a west or south facing window. If the plant gets too much direct sunlight, it may turn a yellowish green in color. Try putting it in a different window or location if this happens. Every few years you’ll need to repot your Areca Palm. The roots prefer a tight container but when they’re too crowded, it will limit the size of the plant. By repotting the plant, you’re going to be replacing the older potting soil that it’s been living in for the past two to three years, and you’ll be giving it newer nutrients that have been leeched out of the soil that it’s been living in. When repotting your plant, be sure that you’re potting it in the same depth as the previous pot. If you plant it too deeply it can cause serious injury to the roots and the rest of the plant. Roots can be very brittle so make sure that you’re very gentle and don’t even try to separate or spread them out. Gently pack the soil around the roots with your fingers and make sure that you’re not over pressing the soil so that you won’t break the fragile roots. After you’ve pressed the soil in, water it deeply and gently press the soil down again to remove any air pockets. Add more soil if required after pressing this soil down. Choose a regular all purpose potting soil that has an added handful of clean builder’s sand mixed well into the soil. Start by filling a tray or your saucer for your planter with pebbles. This will allow your planter to drain properly and save your flooring or tabletop surface. This tray or saucer should be large enough to hold your planter. It should also be deep enough that the planter won’t touch water when you fill the pebbles about two-thirds of the way with water. After putting your planter on the pebbles, fill the planter until the water drains freely from the holes in the bottom of the planter. In the spring and summer months keep the soil moist at all times. In the fall and winter months be sure that you allow your soil to become dry to the touch before you add water to your planter. Areca Palm is a heavy feeder and will require fertilizing each season except for the winter months when the plant is typically dormant. This gives the plant the required nutrients that will help it to look gorgeous all season long. The tender fronds love some micro nutrient spray in the warmer summer months. A liquid houseplant fertilizer that contains micro nutrients will do well for this purpose. Make sure that you’re choosing the right micro nutrient fertilizer for your plant. Dilute the fertilizer according to the label instructions to ensure that you’re not going to give it too much of the product which could result in burned fronds that would eventually fall off of the plant. Avoid fertilizing or feeding the plant during the fall and winter months for best results. Take care to not over fertilize this plant as it may turn yellow if it gets too much of a good thing. Keep in mind that it’s not unusual at all to see sooty flecks on the fronds. These are all natural and not a sign of any pests or disease. If your fronds appear to have dust or dirt on them, you can use a soft damp cloth and gently wipe them off. Learn more about how to clean indoor plant leaves here. Be sure that when you’re doing this, that you check underneath of the leaves for any mealy bugs or spider mites. This plant is very susceptible to both and if you do see them on your leaves, be sure that you wipe them off with your damp cloth. Most people wipe the fronds off about once per month or less. Just keep an eye on them and if they appear to be dull or dusty, then gently wipe them off. Why are my palm tree leaves turning yellow? When the leaves begin to turn yellow, it may be that the plant is getting too much sun or too much water. Check that the plant is getting plenty of drainage and not simply sitting in water which could cause root rot. If the problem continues, it may be time to repot the plant and move it to an area where it won’t get as much direct sunlight. Why are the tips of my Areca Palm brown? When plants are raised indoors they require a steady even temperature that is between 60 and 70 degrees Fahrenheit during daylight hours. At night, the temperature can go down to around 60 degrees Fahrenheit. During cooler winter months the temperatures can drop down to around 55 degrees Fahrenheit. If the Areca Palm becomes too cold, there may be some brownish to reddish areas on the leaves which mean that the plant is chilly. To prevent this, move plants to a room that is at least 55 degrees Fahrenheit at night. Keep the plants away from drafty areas and make sure that they’re not near any vents, windows, or doors. How much water will my Areca Palm require? Areca Palm care requires enough water to keep the soil moist in the warmer months. During the cooler winter months you can allow the soil to dry out to touch between watering. Never allow the soil to completely dry out for more than a few hours. Always make sure that the plant isn’t sitting in water to prevent root rot. When watering, avoid pouring water over the top of the plant, instead, water from the base of the plant. Empty the drainage try when it becomes full, this will help to prevent root rot for your plant. What kind of fertilizer, and how much fertilizer, does my Areca Palm require? It’s important to choose a slow release fertilizer. If the fertilizer builds up in the soil and is too strong, it can cause leaf burn and brown spots. It’s important to use only a slow release fertilizer that is properly diluted to ensure that your plant won’t be over fertilized and that it will grow properly. When in doubt about how much fertilizer to use, be sure that you use less rather than more fertilizer. Does the Areca Palm require high humidity? The Areca Palm is native to the Pacific Islands and areas that have a more tropical climate. These regions are all fairly humid. If you have a very dry air quality in your home your Areca Palm may do better if you increase the humidity level. You can do this by either misting your plant periodically, or by using a humidifier in your home. Can Areca Palm be grown from a cutting? The short answer to this question, is “yes”. The Areca Palm grows by spreading. It sends out offshoots that grow out from the base of the plant. These offshoots look much like bamboo and it’s often called a bamboo palm. Although they spread, the offshoots will eventually grow so tight that they can begin to grow out horizontally. In areas like the Pacific Islands, the Areca Palm is considered to be an invasive species for this reason. While you’re not going to be growing a new plant from actual cuttings, you can grow a new plant by removing these offshoots and planting them in a moist soil. Propagation via cutting isn’t quite the same as it is by simply removing a portion of the plant and repotting it. To repot make sure to dip the roots into a root hormone and plant the offshoot just as you would a regular plant when you repot it. Can you grow Areca Palm from seeds? The Areca Palm can be started from seed, however, it’s going to take about two to four months time for the seeds to germinate and begin to emerge from the soil. You’ll have to be very patient and make sure that you’re keeping the soil moist, but not too wet for proper seed germination. Is the Areca Palm poisonous for pets? According to the American Society for the Prevention of Cruelty to Animals, the plant is listed as nontoxic to cats and dogs. However, if your pet does happen to ingest the plant and shows any signs of distress be sure to contact your veterinarian immediately. If you’re looking for other houseplants that are safe for cats and dogs, check out this article which highlights some of my favorite non-toxic indoor plants. What sorts of pests is the Areca Palm prone to? The Areca Palm is prone to spider mites and mealy bugs. You can remedy this by simply picking them off of your plant, wiping them off of the fronds, or using a mild dish detergent and dipping a cloth into it and wiping the pests off of your plant. For large infestations you may wish to repot the plant removing all pests as you go. You may need to repeat the removal process a few times over the next week or so as the eggs from larvae may hatch out causing another, secondary infestation. Does the Areca Palm flower? Yes, during late spring and early summer months the palm will produce small flowers that are bright yellow in color. They grow from beneath the leaves. Flowers are both male and female and after they bloom a green to yellow fruit will appear where the flowers were. The non-edible oval shaped fruit will turn a bright yellow to an orange color upon ripening and will be approximately 1 inch diameter. 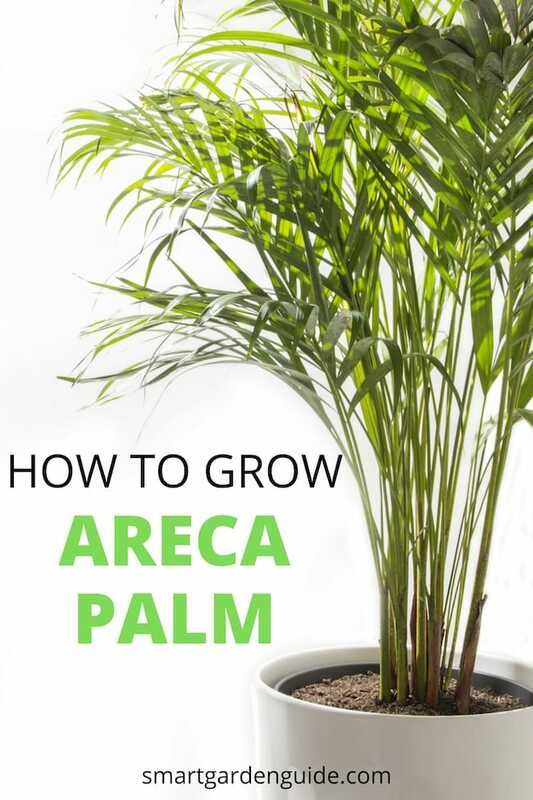 Following these tips should help you to properly care for your Areca Palm and for your Areca Palm to thrive indoors. If you’re looking for more help with growing your houseplants, check out the rest of my indoor gardening and houseplant articles. I’ve also got a really helpful resources page which can help you find the best resources, information and tools to help you keep your plants healthy and make indoor gardening easier. What Is The Best pH For Hydroponics?